The tropics continue to simmer this Monday, and the convection oven is turning up. 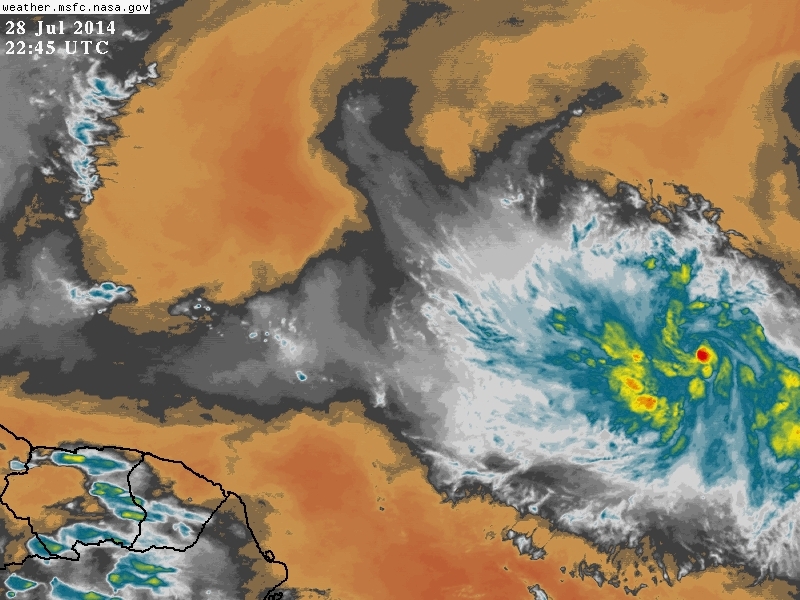 A great deal of organization has occurred today in the disturbance in the east Atlantic. 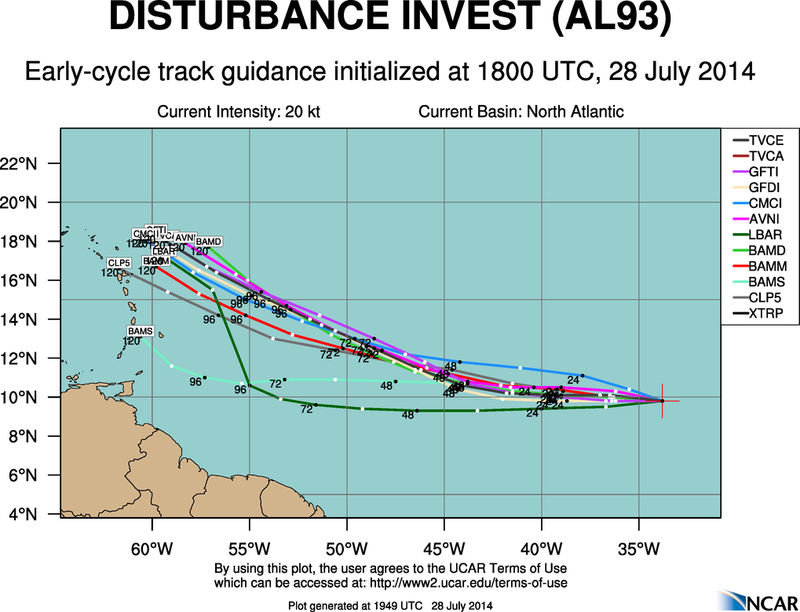 So much so that the disturbance was tagged as Invest 93L. The hurricane models are now running, and a possible recon mission is planned for Thursday. As was expected, this system is doing better than tropical depression #2. Like TD2, this system has a Kelvin Wave passing over it over the next day, and these Kelvin Waves often beef up tropical cyclones in the 48 hours following their passage. Wait! What is a Kelvin Wave? See this week’s Meteorology Mumbo at the top right of this page! 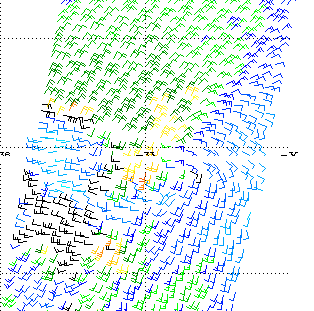 This morning’s ASCAT pass had somewhat removed westerly winds, which are generally a sign of cyclogenesis. At that latitude, winds are generally coming from the opposite direction or from the east. Although this ASCAT pass does not conclusively show a closed center, but satellite imagery has shown an improvement in organization today. The thunderstorm activity requirement needed to be a cyclone has been checked off for quite some time, and the closed center requirement is very close to being checked off as well. My guess is that this will be checked off overnight if we get another ASCAT pass or additional bursts of thunderstorm activity. Earlier microwave imagery actually showed some curved rain bands, which are more typical of tropical storms. 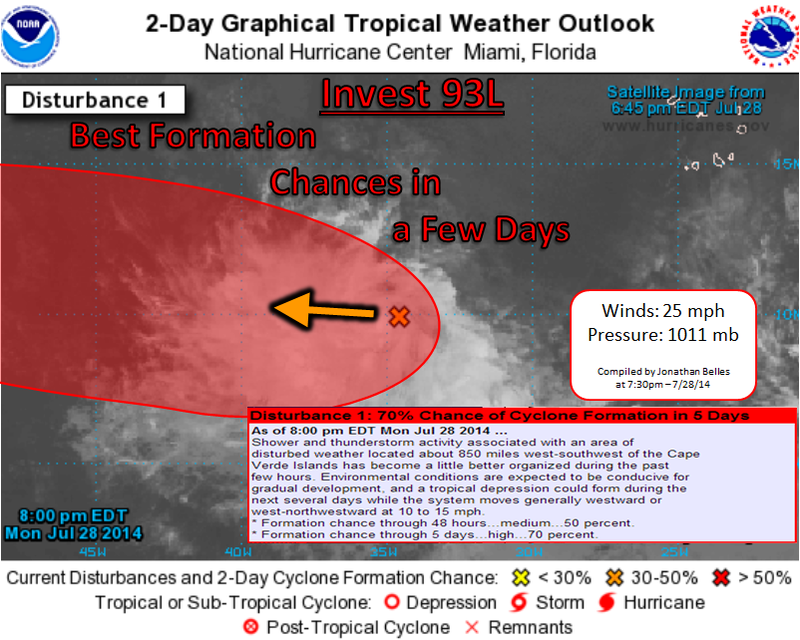 Will 93L Meet TD2’s Demise? Possibly. The latest models, which I will discuss more in depth in the days to come, are showing a large area of high wind shear as this system reaches the Lesser Antilles on Thursday or Friday. An interesting idea is that the GFS had today is that the anticyclone that builds atop strong tropical systems could split that zone of high shear into two distinct zones. An additional reason that this system could weaken is that cooler waters closer to the northeastern Lesser Antilles could get in the way. After 3 days, this amount of confidence going into the forecast falls just a bit. Here’s what the current models say…surprisingly without mention of the cooler water and higher shear. Models are generally trending (our friend) toward the west just a tad. 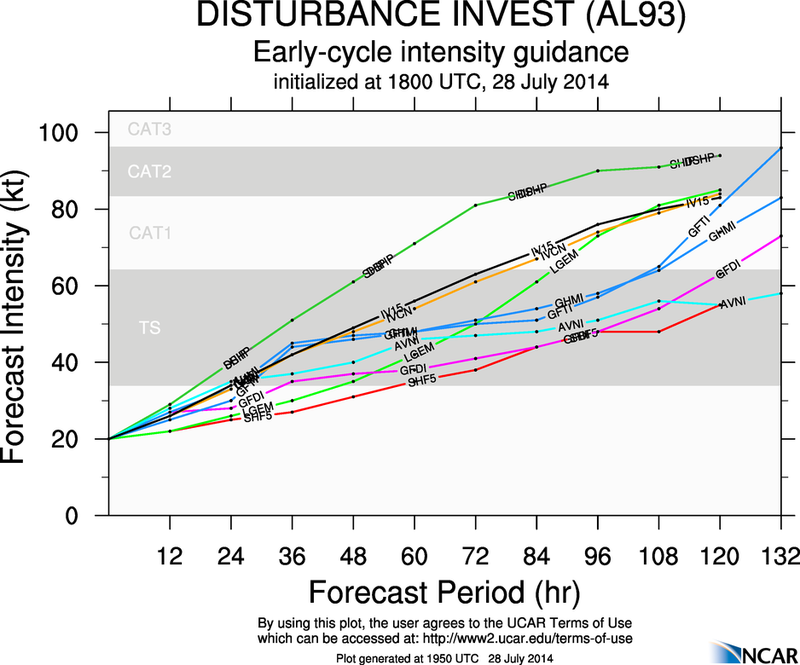 I do think that the intense intensity models will come down as they start to see the higher shear and cooler waters. In the longer term, I do think that the Antilles will get some much needed rainfall from what will likely be Bertha. I expect this pot to continue to bubble and convection to stay steady overnight. Posted on Monday, July 28th, 2014, in Tropical Weather. Bookmark the permalink. Leave a comment.